In my haste to bash out yet another ill-conceived and boring blog post yesterday, I forgot a critical, nay crucial piece of information. It was about that Brambling. It was a year tick! A patch year-tick I mean, I don't go in for all this national year-listing nonsense. Never have, never will. So yes, a patch year-tick, coming in at a rather splendid 110. This a whole two more than last year - a year I thought would never be broken, which, now I come to think of it, is probably exactly what I said the year before that. No matter. I am pleased, which, when it comes to patch-working, is the entire point. You'd have to be pretty stupid to wander round an inland patch year after year whilst hating every minute of it. Yes it would be nice to have a coastal patch, yes it would be nice to have a patch capable of producing a right stonker, but then things like Dunlin would lose their appeal, and we can't be having that. There's an argument that suggests that at a coastal patch the bar is simply higher, and that's true of course, but ultimately there would be far fewer birds with that "wow" factor that is so important in patch-birding and keeps us all going. "Oystercatcher, whatever" is not something you'll hear uttered in Wanstead anytime soon. So what's new? Nothing. All work and no tidying makes Jonathan a dull boy. With the absence of the Magic Fairy, who true to her word departed for pastures new about a month ago, Chateau L is gradually falling apart. Mount Garment grows ever higher, and items now largely lie where they fall. Weekends, so useful for staying more-or-less afloat, are dedicated to having fun rather than domestic trivialities, and so slowly but surely we're descending to a new level of slovenliness. I may or may not engage a cleaner, we'll see how bad it gets before I crack. However if you're local, and bored (really bored), do pop round. The hoover is in the cupboard under the stairs, the dusters are under the sink. Marigolds are provided. Jonathan, I clicked on your link with the express purpose of posting a comment on your escellent contribution to the Wanstead Village Directory. Of course it would have been something utterly puerile like 'Wow! 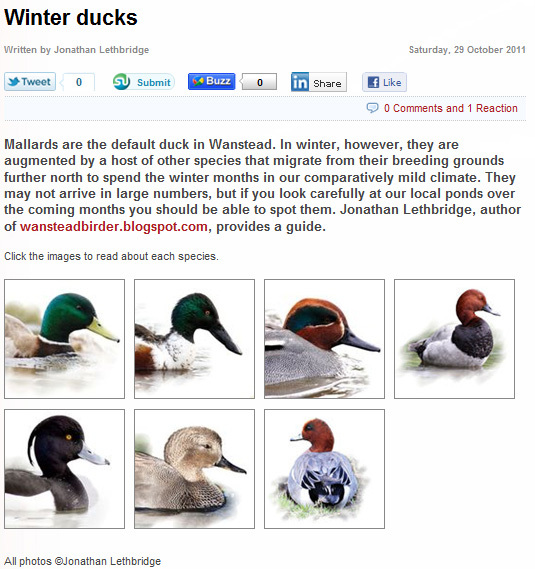 I didn't know Mallards came in so many shapes and colours!' or some such, but Sandra slapped me around a bit and told me to grow up. Re the domestic slide into Dickensian squalor, I always like to invoke Quentin Crisp's dictum: after four years the dust doesn't get any worse. So, sod the housework and enjoy the birds. Ah, I see it's started already. All I can say is it wasn't me. Their server may crash through sheer volume of traffic. And what were the chances of someone called Penelope commenting eh? Hi - is it a yea or nay - then I can leave you alone! I replied "OK"! But I won't make a habit of it! Sorry didn't see your answer. Thank you! For some reason I've only just twigged the 'village' thing. Is Wanstead a desirable locale by any chance? I used to live quite near the 'village' of Pinner in Middx - easily the biggest village in the UK. "So where do you live then?" "Oh, I live in Pinner Village, darling." They actually meant Rayners Lane. Oh yes. We qualify for village status as we have a high street with a heap of useless shops on it, and lovely wooden signs proclaiming said high street. A nice green, a nice church, a nice greengrocers..... I of course live nowhere near it. I live near Forest Gate, a hive of scum and villainly, protected only by Wanstead Flats, which funnily enough went through a recent proposal to be renamed Wanstead Heath. The motivation for selling one's house for a higher price must be very strong. Due to the high demand of duck-loving shoppers, stocks of the current issue of the Wanstead Village Directory have run dry from our display stand in Tesco on Wanstead High Street. If any readers of this blog would like their own copy of the printed issue I have a handful left in reserve which I am happy to post out upon request - just send me an email (details on the Wanstead Village Directory website).